Following a cancer diagnosis and treatment, Norma’s* anxiety fueled depression and substance abuse issues. Her doctor at Swift River Family Medicine Clinic in Rumford, Maine, walked Norma down the hall and introduced her to Tri-County Mental Health Services’ (TCMHS) Clinical Social Worker Velma Evans. At Sonora Regional Medical Center (Sonora Regional) in Sonora, Calif., John’s primary care physician could find no physical reasons for John’s chronic pain, persistent cough and weight gain. So the physician called in Director of Behavioral Health Galyn Savage. Penobscot Community Health Care (PCHC) in Bangor, Maine offers dental care and a variety of specialized health services in addition to primary care. Here Sheila Brijade, DDS, MS, Pediatric Dentist, welcomes a young patient to his first dental appointment. When Ema became pregnant, her primary care physician at La Red Health Center (La Red) in Georgetown, Del., performed a prenatal evaluation that included an oral exam. As healthcare reform encourages integration of healthcare to treat the patient as a whole (see Models of Care Integration Continue to Evolve), behavioral health and oral care—often termed medical silos—are being integrated into primary care practices around the country. Historically, behavioral health and oral care providers had little or no communication with their patients’ primary care physicians. Patient care simply didn’t cross those lines. Proponents involved in the integrated care metamorphosis say that segmented patient care doesn’t have the same positive outcomes that are being demonstrated with integration. When cancer disrupted her life, Norma’s anxiety level contributed to her withdrawal from family and reliance on alcohol to help her cope. A team management approach to her illness, which included Evans helping Norma learn stress management tools and find alternatives to alcohol, resulted in Norma’s current state: cancer-free, alcohol-free and happy again. Savage’s sessions with John and his wife, Susan, revealed underlying behavioral health issues related to John’s unemployment, their subsequent financial distress and Susan’s terror of going into the work world when she had always been a stay-at-home mother to their three children. Savage helped the couple improve communication and coping skills, and even referred Susan for a job. Susan found she loved working and gained confidence in her abilities. John assumed household and parenting duties, and began looking into furthering his education to improve employment options. And Ema, whose mouth revealed extensive tooth decay, was referred to La Red dental staff. Ema received dental treatment as well as instruction on developing home oral care habits for herself and her future children. Research confirms Bridges’ assertion. Calling mental health one of the biggest problems facing modern medicine today, The Integration of Mental Health Into Primary Care, published in June, touts the benefits of behavioral health integration. A Sept. 2012 report, Returning the Mouth to the Body: Integrating Oral Health and Primary Care, labels dental disease one of the great preventable public health challenges of the 21st century. Both publications document high comorbidities between physical diseases and behavioral and oral health problems. Dr. Maryann K. Bailey provides care to a patient at La Red Health Center, a healthcare facility in Georgetown, Del., that offers primary care, behavioral health and oral care co-located under one roof. La Red Dental Director Dr. Maryann Bailey routinely sees toddlers whose mouths are already full of decaying teeth and adult patients whose poor oral health makes it difficult for them to eat. In Maine where TCMHS has integrated mental health services into 12 primary care locations, CEO Catherine Ryder says, “Our integrated care model has resulted in patient care outcomes that are nothing short of miraculous.” Their data demonstrates that integration is cost effective and results in faster diagnoses and treatments for patients. Patients, as well as providers, report improved satisfaction. TCMHS is among 42 grantee sites and more than 150 practice sites with projects in various stages that focus on integration of behavioral health and/or oral care, which are both identified as key elements in Maine’s wide sweeping integration effort. Federally qualified health centers (FQHCs), hospital-affiliated primary care practices, regional mental health organizations, school-based health clinics, state government, statewide organizations and peer-run mental health advocacy and support organizations are participating in integration projects that Maine Health Access Foundation (MeHAF) funds and oversees. Nearly $10 million has been invested in the multi-year process initiated in 2007, according to the Foundation’s Senior Program Officer Becky Boober. 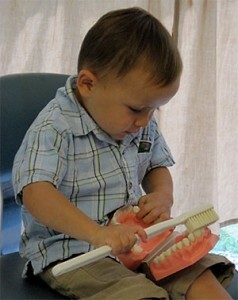 A young patient at PCHC Dental Center learns the value of good dental hygiene. At Penobscot Community Health Care (PCHC), an FQHC based in Bangor, Maine, whose service area includes surrounding small towns and a large rural area, about 40 mental health specialists and 25 dentists are among team members that share physical space and patient electronic health records, meeting regularly to coordinate individual patient care. One of only 30 sites nationwide to receive an “exemplar practice” award from the Robert Wood Johnson Foundation, PCHC has grown in 10 years from one clinic site with 25,000 annual patient visits to 17 service sites providing approximately 350,000 visits for almost 70,000 patients. PCHC’s integrated behavioral health encompasses a public housing clinic, clinics for homeless people, a homeless shelter and pharmacies for medication management. Specialty care and structured programs address specific mental health needs, such as ongoing support for people with severe mental illness. PCHC’s status as one of 44 federally designated teaching health centers in the United States helps meet staffing demands. PCHC annually trains more than 300 students, interns and residents majoring in various healthcare professions, including general and pediatric dentistry. 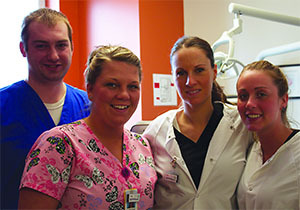 Dental residents supplement staffing, and Schmidt said some have joined PCHC staff after graduating. It doesn’t take a statewide effort to benefit from integration. Healthcare reform encourages behavioral health integration and oral care for the federally funded FQHCs, which has contributed to FQHCs becoming leaders in the integration transformation. Michael Thornsberry, LCSW, Sue Bardsley, PNP, and Yvonne Dodd LCSW, are part of the behavioral health care team at La Red Health Center. In the 11 years since it opened, La Red has evolved from its original function as a 24-hour hotline to a regional FQHC with a new 25,000-square-foot healthcare facility in Georgetown and a second site at Seaford. Primary care, behavioral health and oral care are co-located under one roof in Georgetown. In addition to expanded space for family medicine, lab and other primary medical services, the facility has six behavioral health offices, a child observation room, child therapy room, behavioral health group counseling and education rooms, and eight dental operatories. Primary care providers do oral evaluations and screen all patients for mental health disorders. In the first year of integration, identification and treatment of patients with mental health needs increased by 379 percent. 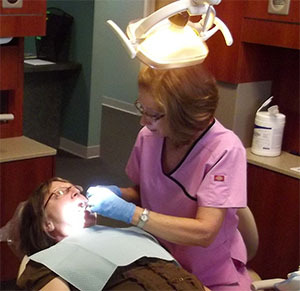 Dental patients increased by 165 percent. La Red dental staff collaborates with physicians to address medical conditions that warrant dental supervision. All pregnant and new moms are referred for oral care instruction. To stretch staff resources for oral care and in response to a patient population that is largely Hispanic, bilingual promotoras have been hired and trained to provide families with basic education and home care supplies. Delaware Technical and Community College dental hygiene students extend La Red staffing by doing exams, pediatric X-rays and simple treatments such as fluoride varnish. La Red’s mental health integration includes routine screenings for domestic violence and sexual abuse. Primary care providers refer patients to mental health providers for age-specific diagnosis and treatment. La Red plans to improve mental health access with the addition of telepsychiatry in the near future. One of only four FQHCs in Delaware, La Red serves approximately 6,500 patients. About one-half of patients have no health insurance. Sonora Regional, where Savage works, began integrating behavioral health with primary care about six years ago and has since begun oral care integration. Sonora Regional is one of 50 rural health clinics (RHCs) owned by Adventist Health. All Adventist Health RHCs provide primary care with various levels of integration including behavioral health and/or oral care. Headquartered in Roseville, Calif., the faith-based, nonprofit Adventist Health operates the largest network of RHCs in California as well as owning and operating hospitals, outpatient centers, home care and hospice agencies, and retirement centers. Primary care physicians, mental health providers and dentists are in particularly short supply in rural areas, making rural integration models even more beneficial, Bridges said. Co-location of services improves patient access and reduces transportation barriers. 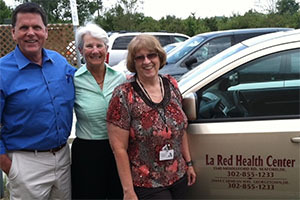 Co-location, using promotoras to assist families with transportation, and requiring an appointment deposit has improved patient attendance at appointments in La Red’s rural Sussex County service area, Bailey said. “Warm handoffs” also produce improve the likelihood that patients will make and keep appointments. When Norma’s physician recognized that family and financial issues were impacting her ability to cope with cancer, he initiated a warm handoff where he personally took Norma to meet a behavioral health provider there. TCMHS, which has contractual arrangements with the primary care clinics, has co-located providers into each clinic. Integration partners also need support systems as they develop their programs. MPCA offers a peer organization coaching model where FQHCs pair as learning partners to enhance their levels of integrated care. * The Rural Monitor is no longer using patients’ last names, to ensure patient privacy. This entry was posted in Features and tagged Behavioral health, California, Cancer, Care coordination, Clinics, Community health workers, Delaware, Dental workforce, Health conditions, Healthcare workforce, Integrated service delivery, Maine, Mental health, Oral health, Prenatal care and obstetrics, Primary care, Rural Health Clinics, Service delivery models on November 18, 2013 by Rural Health Information Hub.